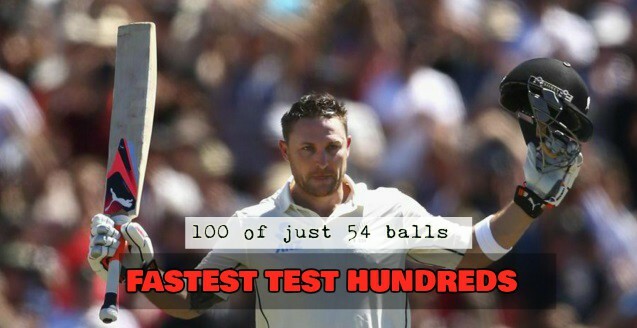 Brandon McCullum scores fastest “Test Century” of all times scoring hundred of just 54 balls breaking the previous record set by Viv Richards and Misbah-ul-Haq both scoring of 56 balls. McCullum playing his last Test of his career as he announced his retirement before the series begin against Australia, 32/3 in the second Test of 2 match series in Christchurch. He took the game away from aussies in matter of overs scoring at a brisk rate and it took just 34 balls to score his fifty and he accelrated afterwards added another 50 of just 20 odd balls completing his 12 hundred of just 54 balls. After watching this inning and taking into account that he scored centuries in his supposedly last two test matches, you only wonder why on earth he is retiring ? McCullum who is playing his 101st test match has scored over 6300 runs including 12 hundreds and 31 fifties. Here is the list of top 10 fastest Centuries ever scored in test cricket. Interestingly perth has seen as many as three fastest centuries in the top 10 list while Australia ended up victim 5 times in the top 10 fastest hundred list. McCullum came close to break the record back in 2014 when he scored century of just 74 balls.